Speedboat floats and can be upgraded with the Underwater motor (item 7350 or RC motor 5536). Banana boat (from item 6980) can be attached to the speedboat. Dolphins float. Price is 23% below the initial Playmobil retail price, a € 6.00 discount! The Diving Trip with Speedboat (6981) Playmobil set is available from the sites below. However, they do not offer delivery to your selected region. 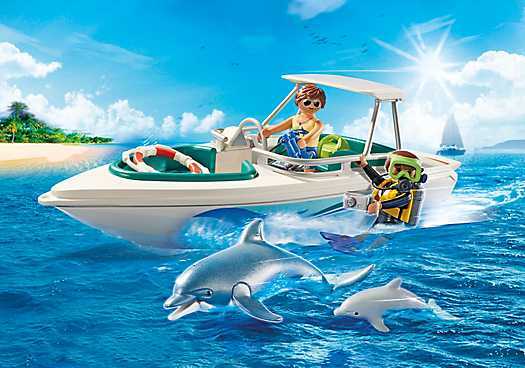 The Diving Trip with Speedboat (6981) Playmobil set is no longer directly available from the sites below. However, 3rd party partners of these sites might still have the set available. Speedboat floats and can ugraded with the underwater motor (item 7350) or the RC Underwater motor (item 5536). There are storage spaces located under the seating, in which the snorkel equipment and sports bags can be stored. Four figures can be seated and are fixed by feet clasps. There is a platform at the rear for diving into the water. Figure with the black wetsuit can be used with either the snorkeling or diving equipment. Dolphins float and are able to stand upright on their fin. Speedboat can be combined with the banana boat from item 6980.